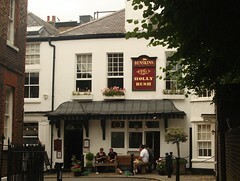 Pub in Hampstead. It was acquired by Fuller's in early 2010; some of the comments below predate this, but aside from the beers available, it does not appear to have changed very much. It has a really nice interior, with nooks and alcoves, candles on the tables, lots of wood, exposed floorboards, and wines written up on a blackboard on the wall. The spaces towards the rear of the pub include a large room adjoining the kitchen photo and some smaller rooms to the side photo towards the toilets, and are all rather dark even during the daytime. There's a separate bookable room upstairs in a light, airy space with comfortable seating. Allolex held a birthday dinner here in early 2007 with about ten friends, and they had a table big enough to accommodate all of us. There are a few seats out the front too; the pub is actually situated in a very nice little courtyard off a very steep side street. Note that they allow booking of the regular pub tables and can get very busy on Sunday lunchtimes and on evenings towards the end of the week, so at peak times it's best to either book or arrive early. Food is served noon-3pm and 6pm-10pm Monday-Friday, noon-5pm and 6pm-10pm Saturday, and noon-5pm, 6pm-9pm Sunday photo of menu as of September 2009. There are also bar snacks available, including home-made sausage rolls (£2.80 as of September 2009). Kake, ilmari, bob, and Phil gave the regular menu a go in February 2008. Everything we tried was good. Mixed olives (£1.50) were a very nice mix of different kinds of olives. Half-pint of prawns (£5) turned out to be six huge shell-on prawns photo. One warning: although the Adnams rarebit (£5.50) was described as a starter, it was enormous photo. Salmon fillet with mash, spinach and tarragon and white wine sauce (£12); duck and cherry sausages with cheddar mash and red onion and marmalade gravy (£9); and organic beef and Harvey's pie with cheddar mash and salad (£9) were all sampled and deemed to be very good. The pies were true pies, with pastry all the way around. We were less enthusiastic about the desserts, but bob thought the cheese plate (£6; Stinking Bishop, Denhay mature Cheddar, and Blacksticks Blue) was very good. These prices are slightly higher than you'd pay in most pubs, but we felt the quality of the food was worth it. Bradders visited for Sunday lunch in September 2009. The Holly Bush is evidently very popular; I turned up early (11:55am) and there was already a small queue outside! Most of the tables were already reserved when I got in, but I was able to nab an alcove. I had a pint of the Old Hooky, which tasted perfectly fine, and had the sea marsh lamb (delicious) followed by the chocolate brownie with pistachio mousse (also superb). My dining companion had beef (which as per her request was served without horseradish sauce) and one of the dessert specials, tiramisu with poached berries. It's worth noting that although we didn't notice that the specials were listed as only being available from 6 onwards, the bar staff offered to check if they could be done earlier and quickly confirmed that they could (although obviously this may not always be the case). Having ordered at about 12:45pm, we were eating by one; the portions were very good, as well as nicely prepared. The only issue we had was that the bill seemed a little high, but on checking it (it was clearly itemised) it was obvious that one of the staff had entered another table's drinks against our bill. This was immediately rectified with a prompt apology and I think this was just bad luck. Overall, a very good Sunday lunch experience and I'd definitely come again. Booking strongly recommended, though. On Ewan's visit in June 2011, there was space in the darker back areas for eating, and the fish pie was excellent quality. Accessibility: A step up to get in. The ladies' is up another step, and the gents' up a couple more. The pub itself is at the top of a steep hill, and the pavement outside is fairly high. Getting here: Come out of Hampstead Station and head to the right around the corner. Cross the road here and then go up the steep hill (Holly Hill) just to the left of the other side of the crossing. As you near the top of the hill, you'll see an old Benskins sign on the left hand side of the road photo taken from the other direction; the pub is in a little courtyard off the right hand side of the road just opposite this. Last visited by Ewan and Kerry, June 2011. Opening hours and food times taken from the Holly Bush website, July 2011. Last edited 2018-02-25 17:02:53 (version 47; diff). List all versions. Page last edited 2018-02-25 17:02:53 (version 47).